Self doubt can creep into your psyche without you even suspecting it’s there until the first niggling thought makes itself clear. This happens to writers all the time. If you're a writer, you must constantly be aware of your thoughts and how you’re reacting to them, so you can weed out thoughts of self-doubt before they grow and take over your creativity and destroy your goals. 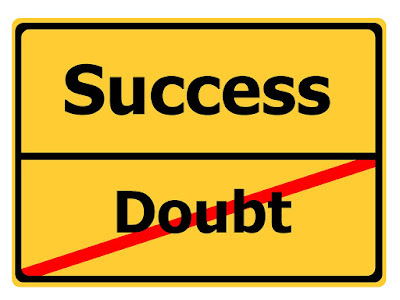 Doubts can run wild in your mind, making you question your abilities about anything new or different. If you’re prepared, you can recognize the doubts for the untrue limiting beliefs they are and let your knowledge and common sense get you through. When you check in to reality, you’ll realize that the negative thoughts are occurring for various reasons. For example, you could be lost in comparing yourself with other writers. This may make you feel inadequate and doubt your ability to succeed. Make a firm decision and stick to it. When self doubt about what you’re trying to accomplish creeps into your thoughts, make a decision to either carry through with your goal or trash it and go on with something else you’re more certain of. If you do decide to go on to something else, don’t think of it as a failure. It was a learning experience that taught you a lesson and you aren’t wasting any more time on it. If you decide to go through with the plan, take action immediately. Making a fast decision may seem impulsive, but most likely the decision is based on intuition and the knowledge that you’ve prepared enough for the journey ahead. You can always fine tune your plan as you progress. At least you’re taking action toward your goals. Replace negative self doubt with positive thoughts. Choose any method that works for you. Meditation, journaling, affirmations, listening to music or reading a good book or simply chatting with positive-minded friends may give you the boost you need to move on. All of us find ourselves dealing with self doubt at some point in our writing careers. But if you let self doubt get the best of you, by feeding into it and actually believing the untrue stories you’re telling yourself, it can destroy even the best of intentions for success. Learn to recognize and weed out the crippling, negative thoughts and get on with achieving the goals you’ve set for yourself. Begin by becoming aware of your thoughts – check in with them a few times a day. You’ll soon be able to discern the “keeper” thoughts from the “discard” pile. She is founder and Director of the Working Writer's Club (membership is free) and offers tips, articles, and additional resources to other writers every weekday morning in The Morning Nudge (which is also free). Great tips, Suzanne, on how to help avoid letting self-doubt put a damper on your writing goals and writing successes.